The update for all versions is available. The users who have downloaded the update yesterday-today morning please re-download it. I have found the bug yesterday and have fixed it today. In this example I have calculated eff. test for aspect and make mouse click around culmination point. Pay attention: I did not drag the mouse cursor from one day to another to to calculate statistic like this "price moves down 2 days before 3 days after culmination". I simply calculated the effect of this aspect for culmination day i.e. make one mouse click around culmination. 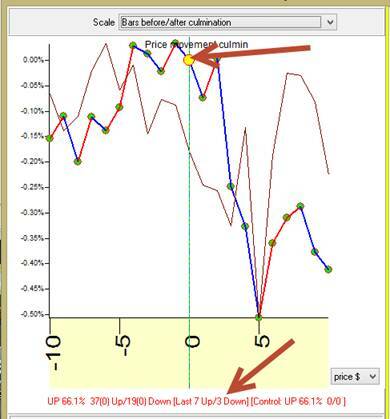 In this example for culmination day the price moved up 37 times versus 19 times up. The movement calculated as difference between close an open price.